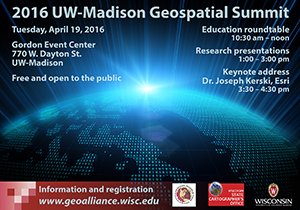 The Geospatial Summit, scheduled for Tuesday, April 19th from 10:30 am – 4:30 pm at UW-Madison’s Gordon Commons, is shaping up to be a great event with 15 concurrent paper sessions, a keynote address by Dr. Joseph Kerski, Esri, and a roundtable discussion on what types of workforce skills are on the horizon and how is higher education responding. Registration is free and there is still time to submit your abstract. The Geospatial Alliance website hosts the details about the Summit, i.e., agenda, parking, directions, etc., located in the “Summit” tab across the top of the page.